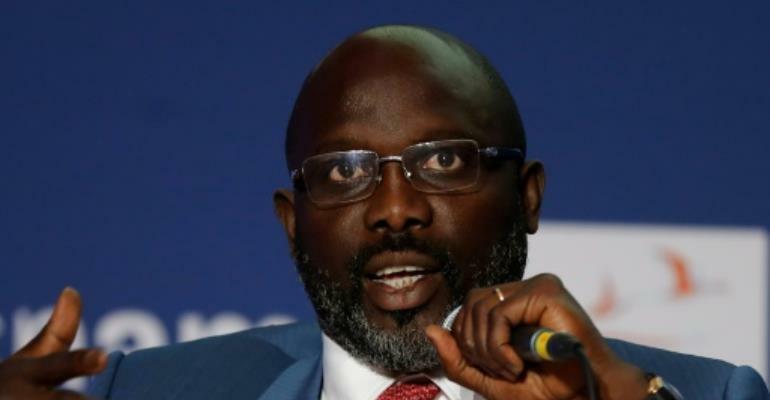 Liberia's new President George Weah on Tuesday pledged to fight endemic corruption as he spoke about conditions in his "broke country" on the first day of an official visit to Paris. The former international football star who, took office on January 22, is faced with a dire economic situation in Liberia following two civil wars and a deadly Ebola epidemic in 2013-2015. "I inherited a country that is very broke, depleted by political malfeasance. We have to make sure that the things that happened will not happen again," Weah said. "I ordered a complete audit to make sure that what belongs to the government goes to the government." Weah also spoke at a conference about another top priority, education for young people who represent 60 percent of 4.7 million Liberians. "I believe in education. Yes, I didn't have the opportunity in my early days but after my carrier I went back to school. Today I can boast of a masters degree," said the new leader, who grew up in a Monrovia slum. Founded 170 years ago by freed slaves, Liberia is "the oldest African country but we don't have an engineering school. We don't even have a diagnosis centre to tell if someone has Ebola," Weah said, vowing to do more to get children in school and "to leave the street". On his first foreign trip as president, Weah on Wednesday will meet with French President Emmanuel Macron at the Elysee Palace, along with several sports figures, and vice president of the World Bank for Africa, Makhtar Diop.